A custom property is an element of an AODocs document. It's a field that provides information for a specific document. Properties can be used to structure documents, to improve the search experience or to customize a workflow. As a library administrator, you can configure custom properties of your Team Folder or Secured Folder library. 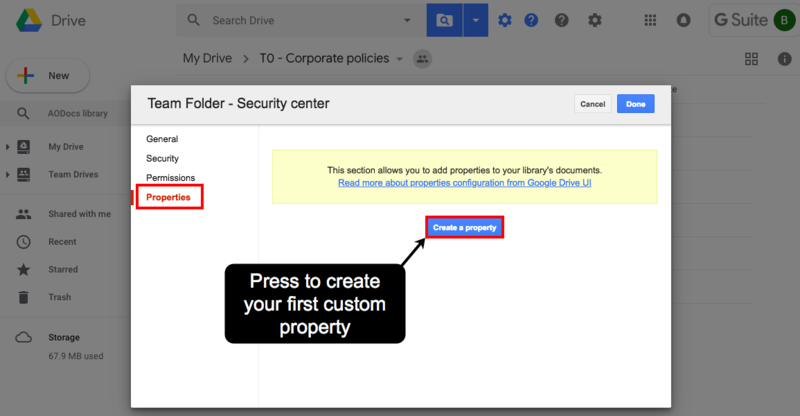 Notes: In Google Drive, you can configure custom properties for the default document class only. If you are working in a Secured Folder library with several document classes, you can configure the custom properties of the non-default document classes in the AODocs library administration interface. 1. 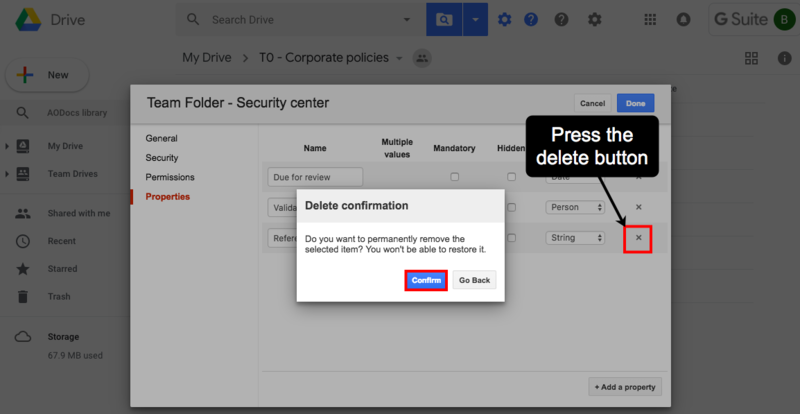 In the Google Drive interface, open an AODocs library where you are defined as an library administrator. 3. In the security center, select Properties. 4. If no custom properties have been configured yet, press Create a property. If one or more properties are configured, press + Add a property to add a new custom property. Note: A Person field accepts Google Groups only if the administrator has set the field as a multi-valued field in the document class configuration. Categories: custom values defined by categories like "Price" and "Country" in our example. End-users can select values from a drop-down list in the user interface. - Custom property values can be used to trigger or validate a workflow state. - Person fields can be used as validators, dates trigger a reminder, etc. Mandatory: the custom property must have a value — it can't be empty when a user creates or edits a document. Hidden: readers and contributors don't see custom properties, so contributors can't edit them. Only library administrators can view hidden properties. Note: You can't define a property as both mandatory and hidden. 8. If required, press Add a property to add another property. 9. Press Done to save your changes. Readers can view custom properties. Contributors can view and edit custom properties. 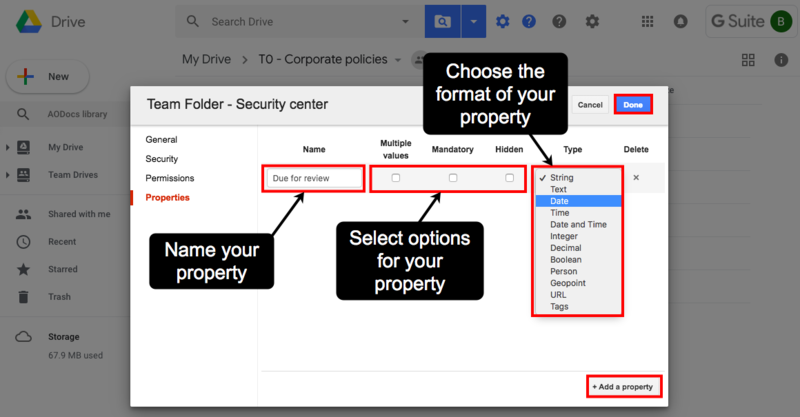 Learn more: Display and edit properties from Google Drive. The list of custom properties is displayed in the Properties tab of the security center. You can add or update a property at any time. 1. Open the Properties tab of the security center. 3. You can select or unselect the checkboxes Multiple values, Mandatory and Hidden. Notes: You can't change a property's type. Use the AODocs library administration interface to add a description or rearrange the order or your properties. 2. Press the delete button to the right of the property you want to remove. 3. Press Confirm to delete the property. Important: You can't delete a property if it's defined in the configuration of a workflow in an automatic transition based on properties.